1) Online by clicking on the button below. 3) Call the office at 942-1010 for a membership form and envelope. Planned Gifts include a set of options designed to fit the donor's family and financial circumstances while ensuring that Bangor Land Trust will be forever able to care for its conservation lands. As is the case with all qualified donations, significant tax benefits can result, reducing income and estate taxation. For more information please call the office and we'd be happy to answer your questions. Please contact the office at (207) 942-1010.
work, there is always something to do! Call us at (207) 942-1010. We'd love to hear from you! The office is in need of a map storage cabinet, hanging map system or even a nice wooden barrel for storing our rolled maps. If you have something that would be suitable and would like to donate it we would be very appreciative! 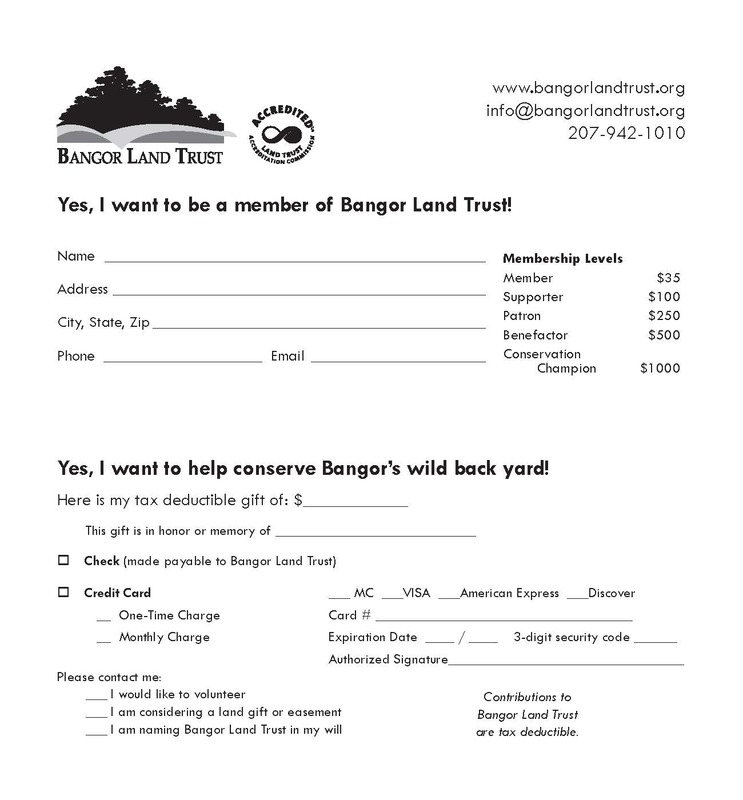 Businesses can support Bangor Land Trust in many ways. Cash gifts, pledges, in-kind donations and grants are all very much appreciated. View our Sponsor Levels and Corresponding Benefits. Call 942-1010 to become a Corporate Sponsor. Thank you!